In my previous post, I introduced the graphical roguelike Decker, and how to obtain it and soften the harsh graphics a bit. Here, we’ll get into Decker’s actual gameplay. 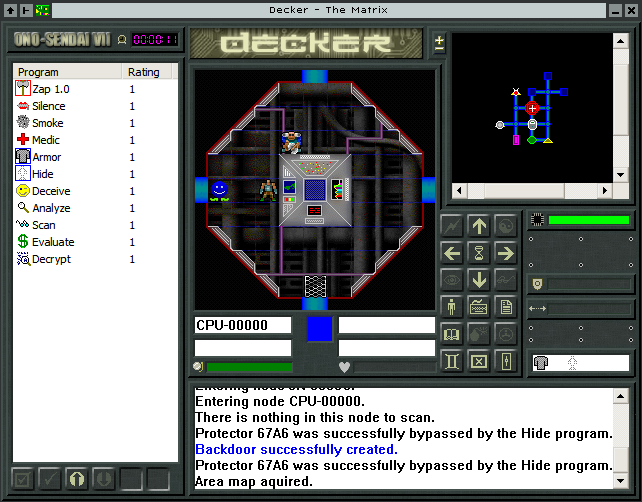 Next to the graphics, the toughest part about getting into Decker is figuring out how to make a living as a hacker in the cyberpunk world of the future. 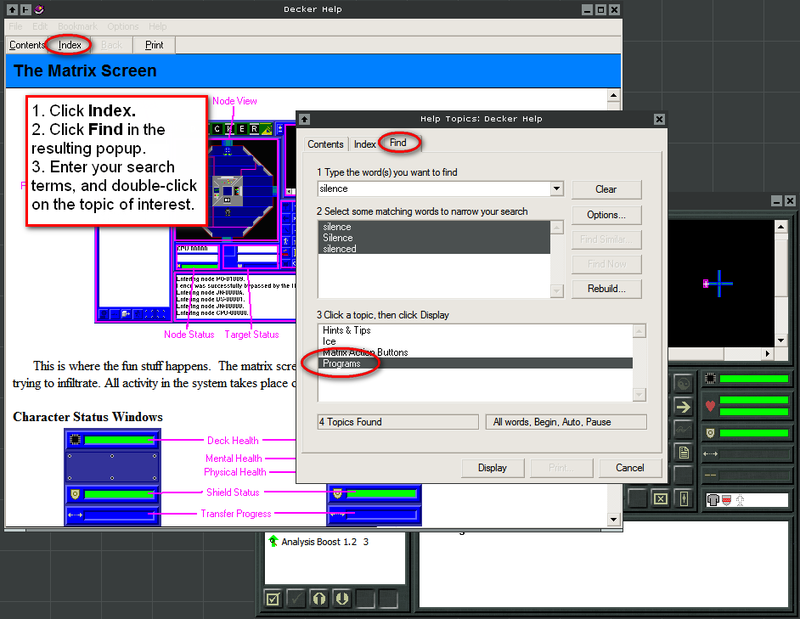 Fortunately, the game itself has a decent helpfile, though you’ll be using the search function quite a bit at first. As this introduction continues, we’ll familiarize ourselves with the interface, and go on a quick mission. Then, you’ll be on your own! Decker’s author has helpfully provided a familiar way to access documentation. 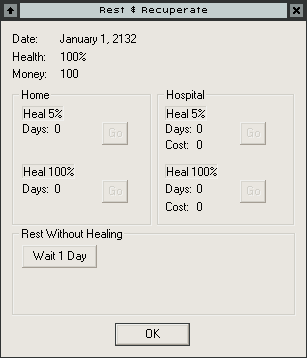 To access the helpfile, hit F1 at any time. You’ll be provided with context-sensitive help right away. However, I find that it’s rare that you’ll find exactly what you’re looking for, so you’ll be searching the whole help file pretty often. The good news is that most features are already pretty well documented. Here’s an example: You’re new to the game, and you’re in the Matrix, fulfilling a contract for a client. You look to the left panel, and you see your software list, but you have no idea what anything does. What’s this “Silence” thing? Hell, what are any of these things??? Hitting F1 will get you general help on the Matrix screen, but not the specific item you’re looking for, so you’ll have to search for it. To do this, click Index, then Find in the popup (see the image below). Type in the search term you’re looking for, and double-click the topic of interest, in this case, the “Programs” topic. Unfortunately, you’ll be searching the help file a lot. Again, you’ll be doing this quite a few times as you play. Speaking of playing, let’s start a new game, and start committing some felonies! 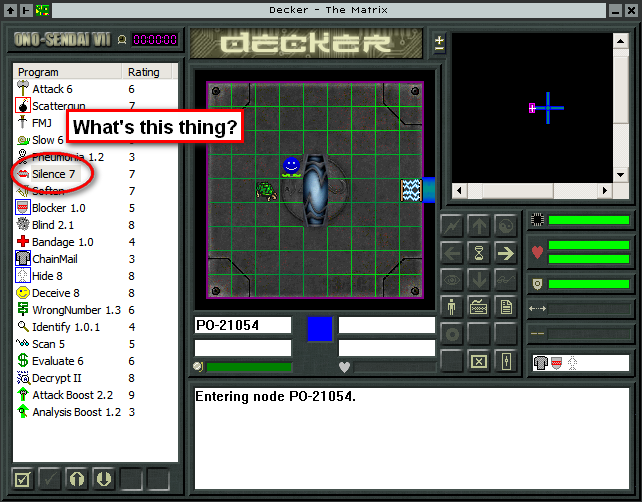 Start Decker, click New Game and create a character. 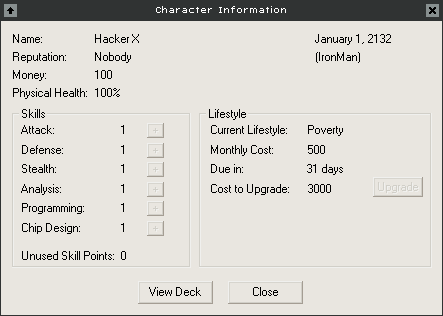 We’re gonna be tough guys here, and select no starting bonus, and go for Ironman Mode, which prevents us from saving and loading when on a mission. Each of the other starting bonuses give you a bump in skill levels, hardware, software, or money. If you’re looking for a decent advantage, I’d go with skills or hardware, maybe software. The Decker hub. Whose life will you ruin today? After creating a character, you’ll start at a kind of hub screen, where you can decide what to do for the day. We’ll go through each of the options, and perform some basic actions as we go. Again, for any of the screens, you can hit F1 to get a detailed review. This character doesn’t have a lot of character yet. We’re completely new on the scene, near flat broke, and completely unknown. That’s going to change over time, but for now, we’re just one cyberthief in a world of cyberthieves. There’s nothing we can do here now, but after just one mission, we’ll be able to come back here and pump up a skill level or two. Note that rent is regularly collected. If you ever lack the cash to pay your rent, your social status takes a beating as your landlord throws you out on the street. If you fail to pay your rent at the lowest class level (Poverty), you’re on the streets and your career is over. After many missions, we’ll earn a reputation and upgrade our lifestyle, which will attract tougher, better paying missions. 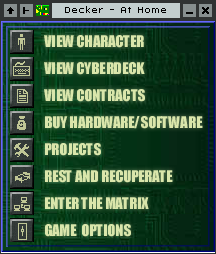 Click Close, then View Cyberdeck, or just click View Deck to move to the next screen. Not much to see here… yet. Hide and Deceive – Hide camoflauges your presence in enemy systems. I believe that each time you enter a node, each ICE has a chance to ‘see through’ this camoflauge. If this happens, the ICE will ask you to identify yourself. This is generally not a good thing. You’ll need to address the curious ICE and either attack it or Deceive it, that is, supply fake user credentials. If Deceive fails you, the whole system goes to yellow alert, and you have only one more chance to Deceive before high alert status is reached. For the yellow and red alert levels, all ICE in the system becomes less easy to fool and more wary of intruders. Smoke emits a blast of static, helping mask your presence when undetected and preventing hostile ICE from following you as you exit a node. However, it also negatively affects your ability to scan files and nodes, and perform attacks. When initially detected by ICE, I’ll typically use Smoke and then Deceive, since it pumps up your Stealth rating temporarily, allowing you to pass as harmless. Silence – If you find yourself about to be detected, you can execute Silence to prevent the node from summoning help from elsewhere in the system. If successful, you can then attack the hostile ICE, and maybe even destroy it before the system gets wise and goes to red alert. Scan and Evaluate – Many systems are treasure troves of illegal data: test answers, blackmail video, pirate software, and secret research. Even if your mission has an alternative objective, it’s often worthwhile to raid file stores and sell the goods on the black market. First, Scan the file store to determine which files are valuable, then Evaluate the to see which are worth the time and disk space. Scan is also required to accomplish any mission calling for the theft or destruction of data. Attack, Medic, and Armor all do roughly what you might think they do. Note the Rating column. A software’s rating roughly determines its effectiveness, though this is augmented somewhat by your skills and hardware. 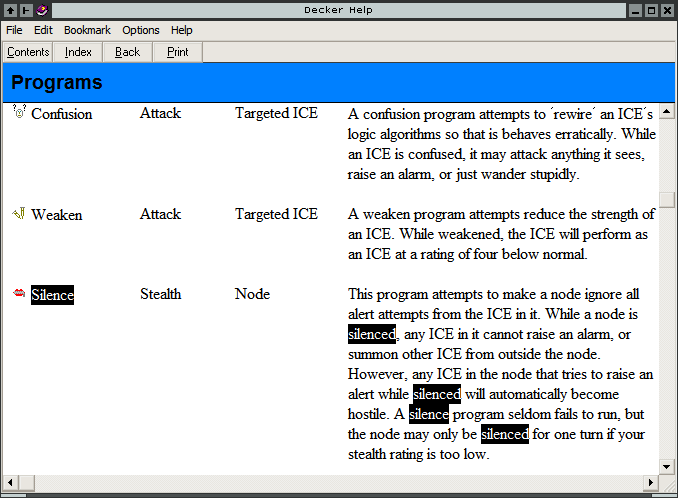 Enemy ICE is also rated, so an ICE of level 5 is likely to see through Hide level 1. The panel of buttons on the right allow you to alter your software listing, so you can fine-tune your deck as you obtain better software. See Decker’s help file for more details. 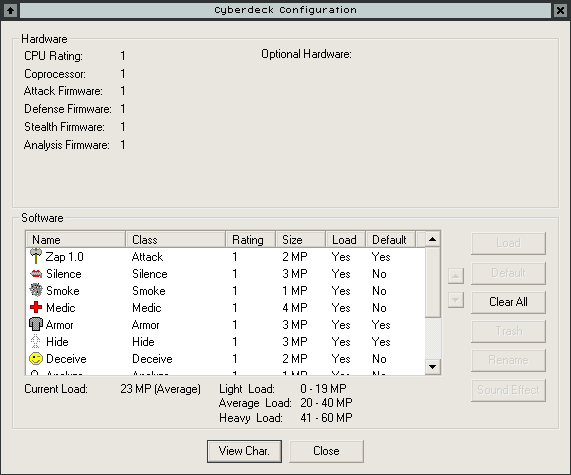 Finally, the amount of software you can load onto your cyberdeck at one time is limited to CPU and Coprocessor rating. Though a “light load” confers some small advantages in the matrix, don’t worry too much about this rating yet. 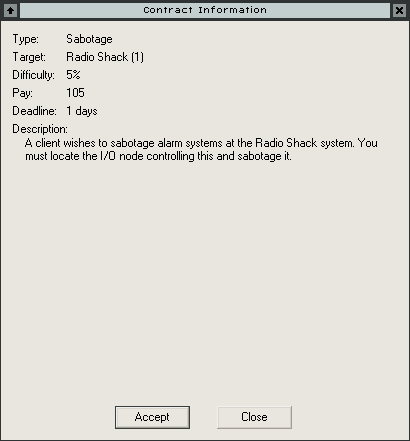 Apparently Radio Shack has been using their own products to protect their systems. The black market for jobs is slim at first, limited by your lack of reputation and lifestyle levels. With a higher rolling lifestyle and a name for yourself, you’ll find tougher, better paying jobs with jucier stuff to steal. For now, double-click on any job to view the details. The description gives you some idea of what your client’s ultimate goal may be. 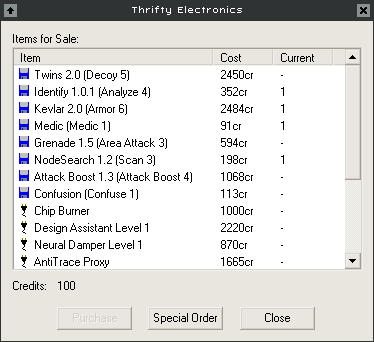 We may be enabling some corporate B & E.
Window shopping is all we can afford for now. Apparently there’s only one shop in town, and that’s Thrifty Electronics. We can’t afford anything here yet, though, but it can’t hurt to peruse. Again, hit F1 and perform a search to inquire on anything specific, but you’ll eventually make use of most of what you see here. If you don’t see something you want in the market, you can Special Order just about anything if you don’t mind shelling out for it. Or, you can build it yourself on the Projects screen. No self-respecting future hacker lacks the knowhow to build his own chips and software! Click New to see what your skill levels allow you to design. Not much, is it? Raising your Hardware and Software skills will also raise the quality of hardware or software you can design. For now, though, nothing you can design is worth the trouble. Creating a chip or other hardware is a two step process. 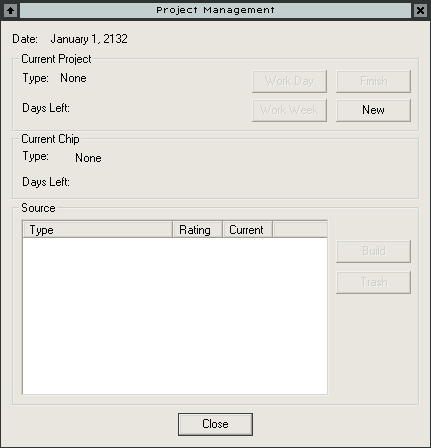 First, you design the chip, which takes a good amount of personal time, sometimes longer than a month. Then, you need a chip burner to actually create the chip, which can take an equally long period of time. Don’t design a chip unless you have, or plan to purchase, a chip burner! You don’t need to do anything special with software you’ve designed, except load it into your deck this screen, or the Deck screen. Finally, when you work on a project, you’re not able to fulfill contracts, so make sure you don’t have one open. Also, make sure your rent is paid up. You don’t want to lose the game while dallying with circuitry! Expensive, crappy healthcare? I wonder what country this game is based in. Believe it or not, you can get injured in the matrix. Sufficiently angered ICE can start a trace on your location send a power surge straight into your brain stem, given enough time. (You can detect traces with a certain hardware upgrade.) If you incur this or other injuries, you may need to lay up for a bit. The increment of time required for recovery rises higher with each percent of health lost, such that getting knocked down to 65% to can take a lot longer to recover from than 80%. This screen is mostly self-explanatory. Here’s where you save and load games, and control the sounds. Once you’ve accepted a contract, click this to start your mission! 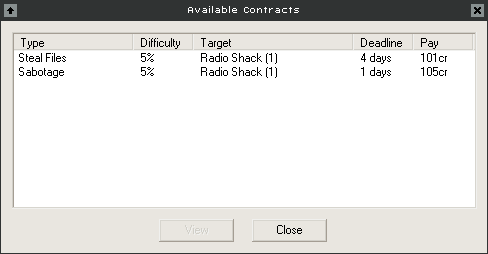 We’ll begin with the Radio Shack mission in my next post. Sneak preview of backdoor action in our first mission! 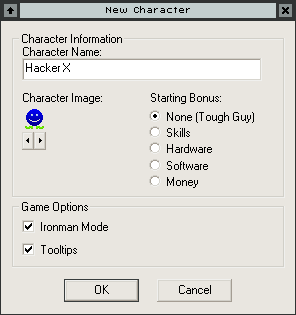 For such a small game, there’s quite a lot to managing your career as a hacker. I was quite mystified when starting out, so I hope I’ve made things a bit easier for others in this series. Part 3 covers a complete mission in which we infiltrate the poorly protected systems of Radio Shack, and steal all we can along the way. How so? Be specific and include lots of details!